Although nominally protected by a plethora of laws, and championed in several well-intentioned declarations and charters, today's worker often feels adrift on an uncharted sea subject to unpredictable currents that have nothing to do with the quality of his or her work. Can we get at the root of this serious problem? We can at least determine if our existing legal systems, especially in the area of collective bargaining, discrimination, social security and European integration are able and ready to tackle the world-of-work challenges that confront us. And if they are not, we can begin to formulate a basis for new and effective labour and social security laws. This was in fact the essential impetus for the European Conference of the International Society of Labour Law and Social Security held in Stockholm in September 2002, a ground-breaking conference of which this book is the written record. In general, the papers stress the European situation, as it is in the EU, both as it exists today and as it is likely to be in the foreseeable future, a community of twenty-five nations, that the major work challenges are felt, and that the legal debate on relevant issues is strongest and most open. 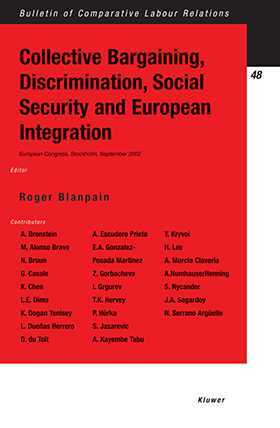 However, the twenty-four distinguished authors include representatives from countries as far-flung as Belarus and Congo, Korea and Turkey, and with these contributions the analysis extends to a study of fundamental rights as they actually exist under a wide variety of labour and social security law regimes in today's world. Collective Bargaining, Discrimination, Social Security and European Integration should not be overlooked by any policymaker or academic in the fields of labour and industrial relations law or social security law. It is one of the most detailed and current investigations we have of a situation that threatens to become a crisis in contemporary law and society.